Remember those floor mats you step on every time you get into your vehicle? Most people can’t even remember the color of their mats or whether they even have any in their vehicle. But auto floor mats are more important than you realize. These often-ignored vehicle accessories actually play an important role in protecting your vehicle. Floor mats do their job daily, whether you think about them or not. Replacing or upgrading auto floor mats may be the simplest option to spruce up your vehicle interior other than an air freshener. It may also be the most cost-effective protective maintenance you can do to save money over the life of your vehicle. Carpet vs. Rubber Floor Mats: Which Should You Choose? Just like any topic of discussion (or argument) around the garage, carpet vs. rubber floor mats is going to boil down to preference. I prefer products that perform in my vehicles just like you. Each type of floor mat has appeal, so follow your insight into how you want your vehicle to look and the practicality of your floor mat choice. 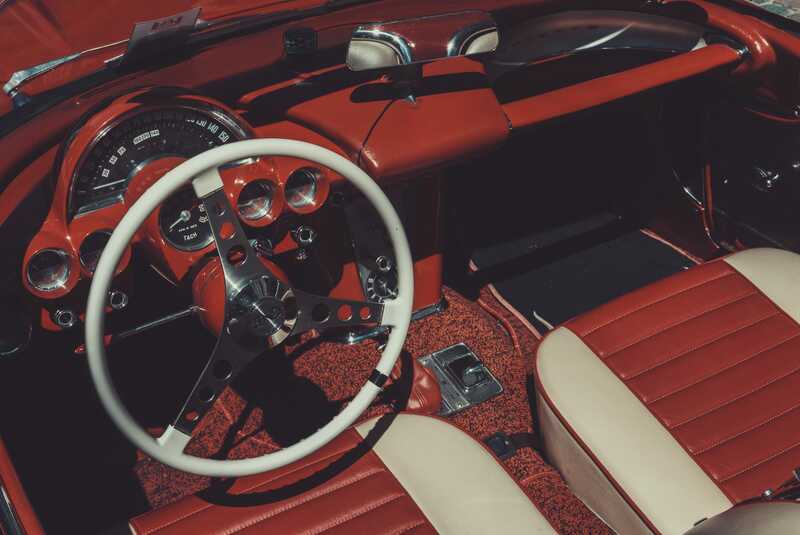 Style and comfort lead the top preferences for those wanting carpet floor mats. Color or embroidery selections – even in some universal items – allow for a variety of customization options. These can have car make and model options or even pro sports team designs. Carpet mats require regular cleaning and care (trust me, you don’t want to leave dried up milk or soda in the carpet for weeks). Top name brands will deliver higher quality carpet mats, but lesser-known brands deliver affordability that can be replaced regularly if needed. Rubber floor mats lead the way in durability and simplicity when it comes to cleaning. Yank rubber mats out of the car, hose them down, and slap them back on the floor boards. 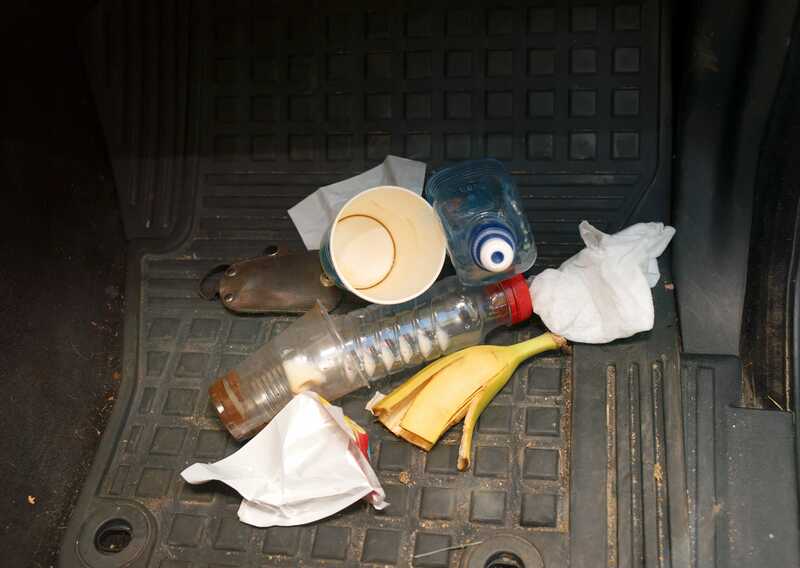 Rubber mats handle water, dirt, mud, snow, ice, road grime, beverage spills, and food with ease. If you can get a spill to land and stay on the mat, the mess won’t get to the interior carpeting. High-tech materials in rubber mats deliver as promised for protection, and I believe their designs provide a solid non-slip feature in most vehicle models. Rubber tires grip the road, rubber-soled boots grip the ground, and rubber mats stay in place better on car floors. Fancified design options may be limited in universal rubber car mats, but the newer tread patterns that catch dirt and spills add a stylish flair. Rubber mats provide practical protection, then style. It’s a preference. So, let’s step right into (pun intended) the process of selecting proper car floor mats and detail some great options to protect the vehicle you love. While there are many customized floor mat options on the market, I’m going to stick with car mats that have a universal fit for most vehicles and deliver at an affordable price. I love it when a replacement or add-on accessory adds flair to my vehicle. It justifies the purchase on an emotional level. Admit it, our vehicles are a part of our persona. 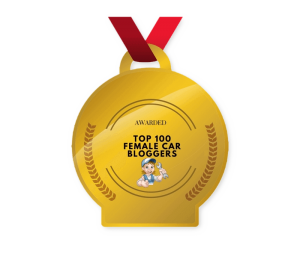 It’s even better when you can brag a little about value and performance. 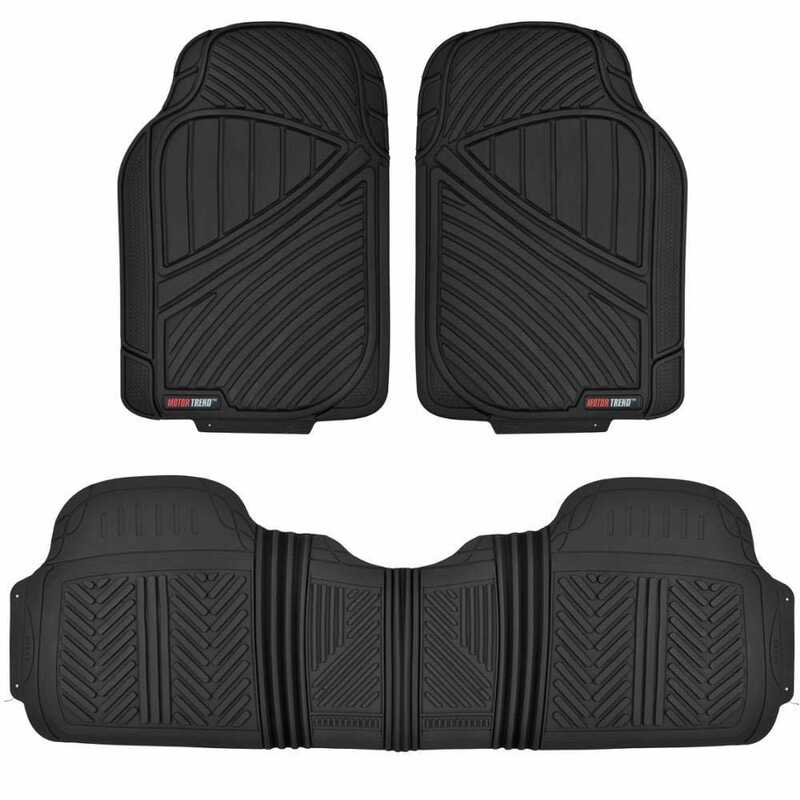 Firestone Firehawk Rubber Floor Mats deliver that flair with this set of four mats with a universal shape designed to fit most cars, trucks, and SUVs. If you’re looking for value and long-lasting mats, these durable, washable mats are ready to install right out of the box. These mats are molded with the front design similar to the Firestone Firehawk performance tire tread pattern. This channeled design helps retain moisture, dirt, and debris to help keep your vehicle dry and clean. These could be what you’re looking for if you have pets and they ride in your vehicle often. Firestone Firehawk mats are constructed from a thermal-plastic rubber material. Despite the tire look and feel, these mats are made of a soft, odorless rubber designed to mold to the vehicle floor. The mats also resist curling or cracking in hot or cold climates. Car mats tend to slip around so Firestone added an anti-skid nib backing to keep the mats in place. Even though these are heavy-duty mats, you can trim the mats to fit your car if needed. Household scissors will do the trick when trimming for size. Firestone mats are sold in sets of four to cover floor space in the front and back seating areas of your vehicle. WeatherTech has branded its products as some of the most effective and affordable vehicle accessories designed to protect vehicles. 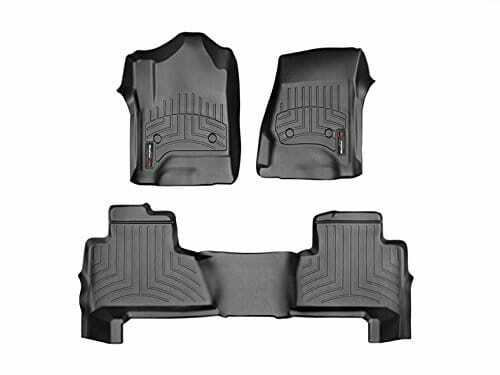 The WeatherTech floor mats for all vehicles come in a set of four, are moderately priced, and are designed to adjust size to fit your vehicle. These mats are like debris traps with higher outer ridges and channels that work to direct water or spilled drinks to the lower half of the mat. Fluids, and any debris, get trapped in this reservoir area to keep such messes away from feet and clothes. This is a nice feature when you need to trap a sudden mess and then pull the mats out for a quick cleaning without a lot of fuss. Just clean, rinse, and place the mat back in your car. 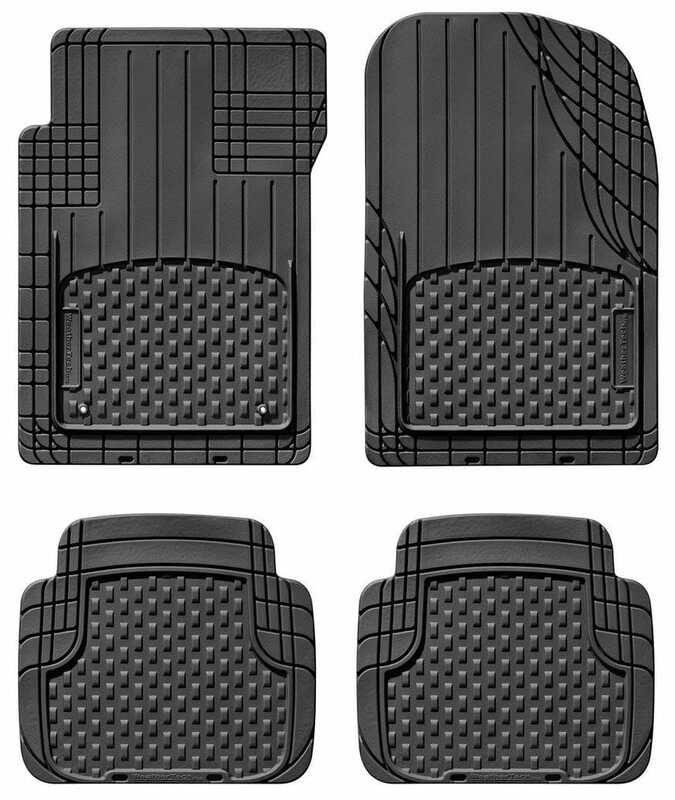 While these are universal mats, they do have a unique “left” and “right” design for a more snug fit on driver and passenger sides of the front vehicle floor spaces. WeatherTech promotes that its design covers most vehicles for a more ideal fit. Adding to this universal design is the ability to trim or cut these mats along suggested trim lines or as you see desire to customize the mat shapes. If you want mats that arrive ready to use or would like to reserve judgment over a customized feel, this set of four mats may be the all-in-one design for you. WeatherTech molds these mats from an odorless, non-toxic advanced plastic. The mats are designed to maintain flexibility in cold temperatures and keep their shape over extended use. I like the “molded-in-nibs” on the bottom of the mats that help keep them in place for comfort and safety. WeatherTech delivers these in available colors of black, tan, or grey. 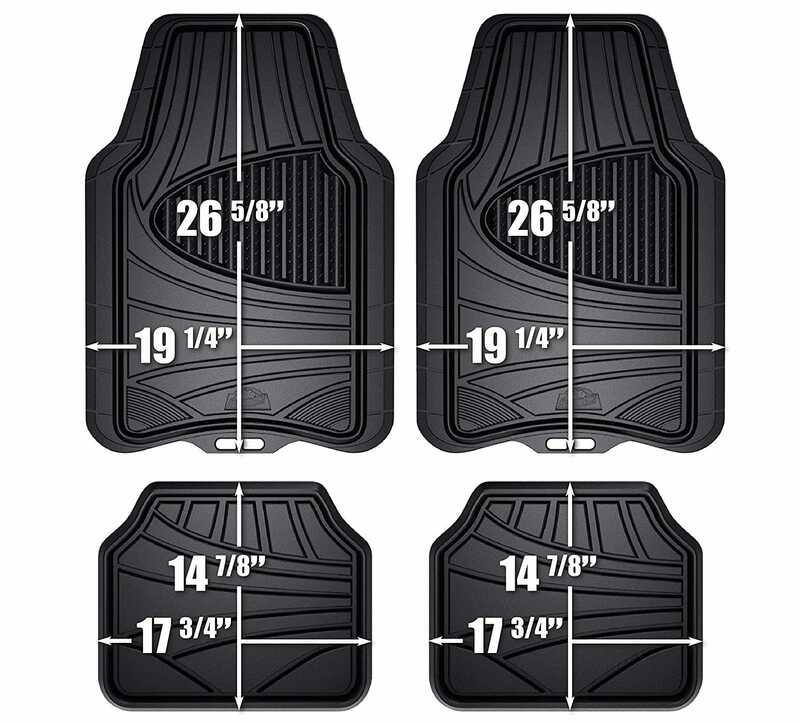 OK, I’m going to fudge a little with this selection because these mats aren’t truly “universal.” There are added features to these Motor Trend Heavy-Duty Rubber Floor Mats that justify you having to make sure you order the correct size for your vehicle make and model. Make sure you select your proper size and you’ll understand why there are so many positive customer reviews of these Motor Trend floor mats for cars, trucks, and SUVs. If the size isn’t spot-on, you can even trim these if needed. Just don’t order them too small for your vehicle. Every floor mat manufacturer claims their rubber mats don’t smell like, well, rubber. 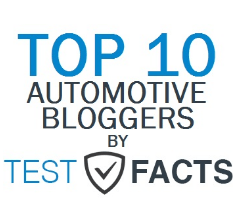 Motor Trend backs its claim with a statement – these mats are 100 percent odorless. You’ll have to judge for yourself after a few days of the mats sitting in a hot car, but my expectation is you’ll be pleased. MotorTrend helps keep this set of three mats in place with the typical non-skid backing plus the fact these mats are heavier than most. The weight of these thick, heavy-duty floor mats helps them stay in place. 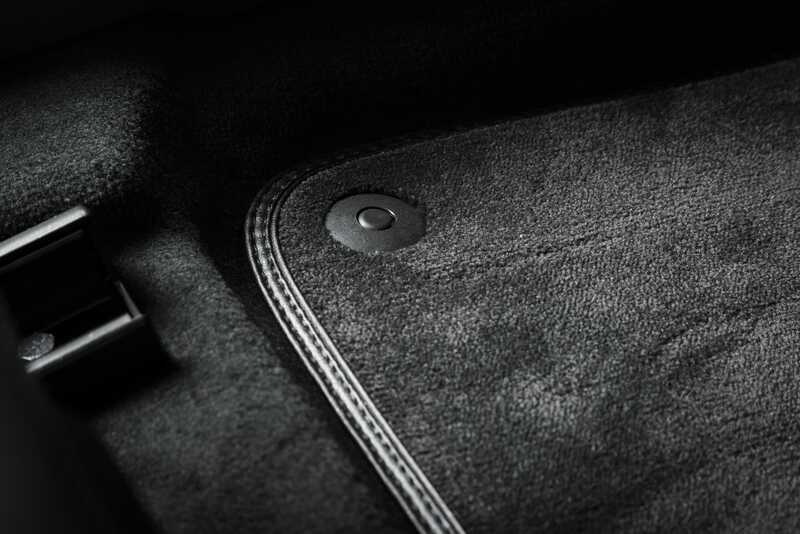 Thicker design doesn’t take away from the mats flexing to the contour of a vehicle’s floor board. Heavier design also provides more durability, so these mats stand up to extreme temperatures in all climates. Unique ridge designs cutting across the face of the mats help trap dirt and spills. The high-quality polymer material keeps water, debris, and grime away from vehicle carpeting and you. A mild detergent solution and a garden hose will get these mats cleaned quickly as needed. One of the added features of these mats is the connected rear seat design. Normally there are two separate mats for the rear seat floor space, but MotorTrend connects the mats for what is essentially an extra mat. Spills and splatter often extend into the middle of the rear seat area and this added mat extension will guard against such messes. That’s a plus for anyone with regular back-seat passengers or those with pets that run from side to side in the back seat. Armor All Carpet Claw, fit-to-trim floor mats have enough catch phrases in the name to make these a tempting buy. Fancy names aside, I like that these floor mats offer features people need to protect their cars. You want mats built so they won’t warp or crack in extreme heat or cold. Mats that fail in these areas leave your floor boards and carpeting exposed to grinding dirt or damaging liquids. The heavy-duty rubber material holds up against water and debris. Deep valleys and high ridges in the tread patter design help contain spills. Armor All made this set of four mats ready for a battle as soon as they’re installed. There is an interesting no-slip design with the Carpet Claw backing. The “claws” are strategically placed nodules on the backs of the mats. Each claw is a patent-pending design like a rubber golf shoe spike that grips the interior carpeting or flooring to prevent slipping. Anything to keep the mats in place when I drag my feet getting into the car is a plus for me. Keep in mind these auto floor mats are a design meant to be trimmed as needed. I wouldn’t expect a spot-on custom fit when I open the package. Grab a pair of scissors and follow the universal cut lines in the mats and installation will be simple and quick. Not everyone wants rubber mats, so I wanted to include a set of carpet floor mats as an option. Carpet mats have advantages if your preferences are more for a soft feel to the mats and a look closer to original set. If you’re looking to replace old, dirty original mats or hide worn out floor board carpet, Zone Tech replacement car mats are a possible option. 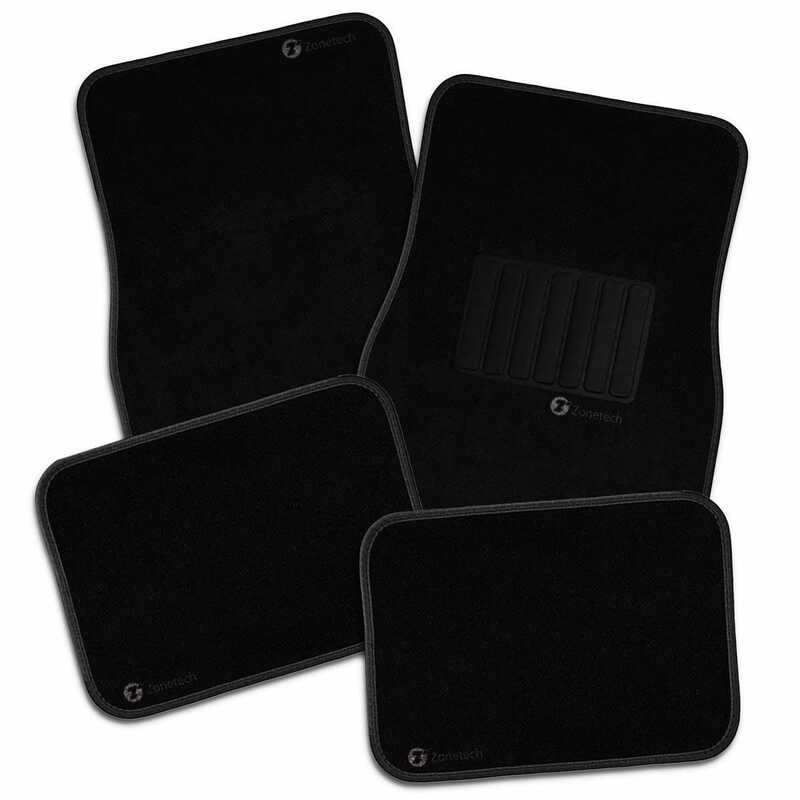 This set of four mats can provide a neat and clean new look to your ride. Carpet can be comfy for floor mats and Zone Tech delivers an affordable set designed to take on the wear and tear of protecting your interior from dirt and spills. Better for the mats to take on the messes and not your car interior. Heavy-duty carpet mats won’t hose down easily like rubber versions, but mild detergent and proper drying outside will clean carpet mats as needed. It doesn’t hurt to take a broom to the carpet and then vacuum the mats. To keep the mats in place, there is a heavy “nibbled” backing to avoid skids. The mats also have a vinyl heel pad so shoe soles rest on the vinyl and not on the carpet. This cuts down on dirt and water in the carpet material and lessens long-term wear. Quality and price don’t always match. When it comes to price and quality with car mats, affordable universal mats are a great buy for most people. Higher-priced, custom-cut, high-tech floor mats that cost hundreds of dollars can fit your car like a glove and should last for years. Price in these models does equal quality. If you’re looking for high-end, custom-fitting floor mats, you might want to consider the WeatherTech DigitalFit Floor Liner set. These are made in the U.S.A and custom-molded to match your vehicle floor space. Make sure to follow all sizing and selection details when ordering. 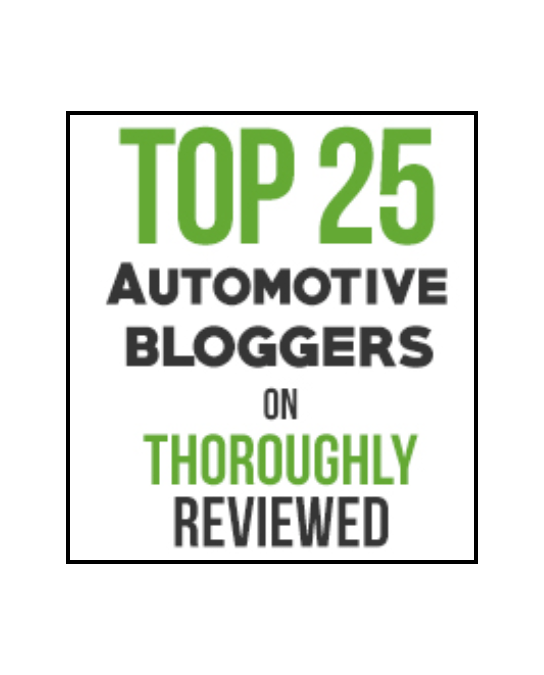 The auto floor mats I’ve reviewed above are mostly universal – they should fit most vehicles based on make and model or minor trimming for fit. Installing these types of mats is straight forward. You should still measure your vehicle floor board space, front and rear seat areas, to make sure you can order a properly sized set of mats. Like the carpenter says, measure twice and order once (or something close to that). Sizing the mats properly means they should arrive ready to install out of the box for carpet mats and maybe minor trimming for rubber mats. It’s a great feeling when you order floor mats and they fit well from the start. Even a little trimming adds a feeling of accomplishment. Be sure to place the mats appropriately, front and rear, and press down on them to help the non-slip backing seat itself into the floor carpeting. Sounds simple, but some of the rubber “nibbed” backings can use extra pressure so they grab the carpeting. Also check for factory retention posts in the floorboard. If present and the mats have matching connectors, make sure the latches are secure. These won’t always be present on universal mats but check anyway. If there are no connectors on the rubber mats, you could get creative and trim the mats to fit. Double-check your measurements before cutting extra holes in the mats. Always make sure any new mats placed on the driver’s side do not block the brake or gas pedals. A loose or improperly positioned mat can slide under the pedals and cause real problems while driving. Safety first and fit the mats properly. Also inspect that the mats don’t interfere with any seat adjustments. It’s not a fun feeling to get the mats all squared away and realize you can’t move your seat forward. You should read the manufacturer installation instructions. I know it’s beneath some of the people who hang out around the garage, but sometimes those instructions have tips to help installation go more smoothly. The easier and simpler the installation the better. 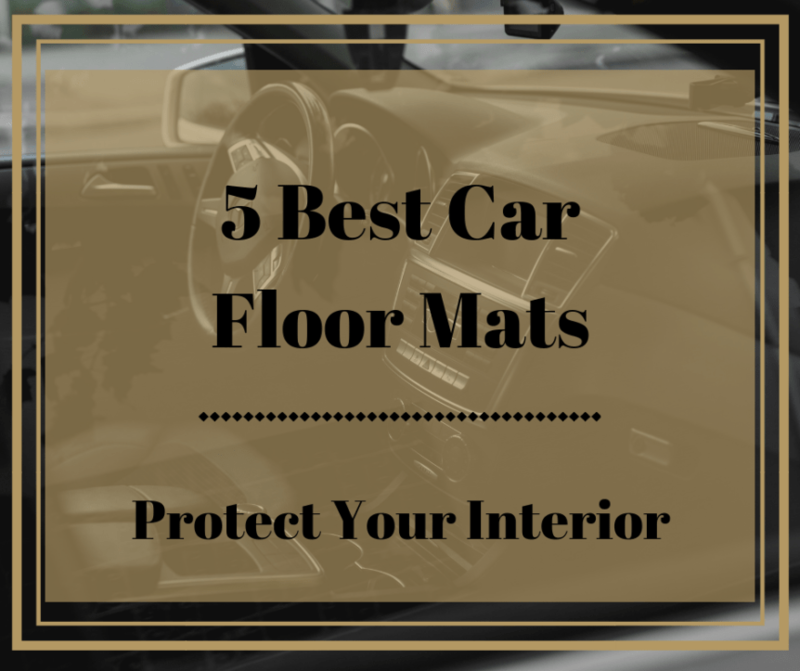 Whether you prefer carpet or rubber car mats, it's important that your floor is covered. It helps maintain the quality of your car while serving as a catchall for dirt, road salt, and other debris that could otherwise damage the floor of your vehicle. Stylish floor mats add a nice touch to your favorite ride, but never sacrifice quality for appearance. Be sure to do your research before purchasing your next car floor mats!